Interesting Timbers is a family owned and operated business, David and Catherine supply quality Native, English Hardwoods and Soft Woods. For thirty-three years we have specialised in sawmilling, drying and selling individual Interesting Timber, we sawmill onsite and continue to process home grown trees to produce air dried and kiln dried English Hardwood Timbers. When you visit or contact Interesting Timbers you will always meet or talk to us, David and Catherine (the family behind Interesting Timbers) and we will be happy to help you with your enquiry or assist in the selection of timber, supported by other members of our team. Catherine's links to sawmilling can be traced back to 1884. No order too large or small. We spend time in the cutting and drying of our large slab timber and general timber stocks which we carefully season over many years before we offer this beautiful natural product to our clients. We sell seasoned timber for furniture making usage. We also sell Freshly Sawn Timber (wet timber) for a variety of uses; please ask us if you require this. We are based on the glorious Mendip Hills above the historic city of Wells in Somerset, 16 miles from Bath and Bristol. With the Interesting Timbers team, David and Catherine are happy to assist you with your bespoke and individual timber needs. We can supply your Waney Edged (Natural Live Edge) and Square Edged, British Timber (Native Hardwood, Native Timber, English Hardwood, English Timber, English Woods, British Wood) requirements in small or large quantities as Waney or Square Edged timber. 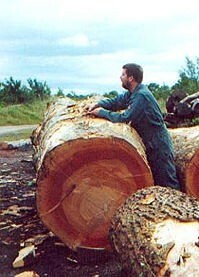 We can plane and prepare timber to your list and provide your English Wood supplies. We can supply from stock or cut to order Beams and Timber Cladding for building purposes. Ask us for a quote. Our Window Boards and Shelves, made to order for you, are available Waney Edged and Straight Edged. Feather Edged Cladding, Fresh Sawn Waney Edge Cladding and Beams are from stock or cut to order. We produce Traditional Solid Oak Flooring, Oak Skirting and Architrave to order. Our Bespoke Staircases are Supplied in Self Assembly Kit Form and are designed by David for you and made to order only. We can also design and make Oak Framed buildings from a simple porch to a complete home. Interesting Timbers specialises in Oak Framed Roof Trusses for extensions, barn conversions and new builds. Ask us about timber for your project, we are experienced in the cutting, drying and selecting of timber and as well as our general timber we provide difficult to locate timber for: furniture makers, designers, traditional wood crafters, hobbyists, artists, architects, builders, self-builders, DIY home projects, professional and amateur woodworkers, carvers and turners. Visitors to our yard are welcome, by appointment (we may need to arrange to get stacks of timber out for you to view, this may take an hour or so, it may be wise to book an appointment) during normal yard opening hours. Alongside our general selection of kiln dried and air dried timber stock we have some stocks of Elm and Pippy Oak. Timber Table Tops, Worktops, Desk & Bar.. In addition to our general machining services we offer a specialist 'extra wide' machining and planing service for furniture makers and designers. Extra Wide Machining: plane and flatten up to approximately 1.8 metres wide and just under 6 metres in length. Please ask if you think that you might be interested in this service. We were delighted to be featured on the 100K House Tricks Of The Trade: Interesting Timbers provided the Ash desk for Madelaine’s Creative Space Project and Ash for the wash stand, windowsill and shelves in the bathroom.